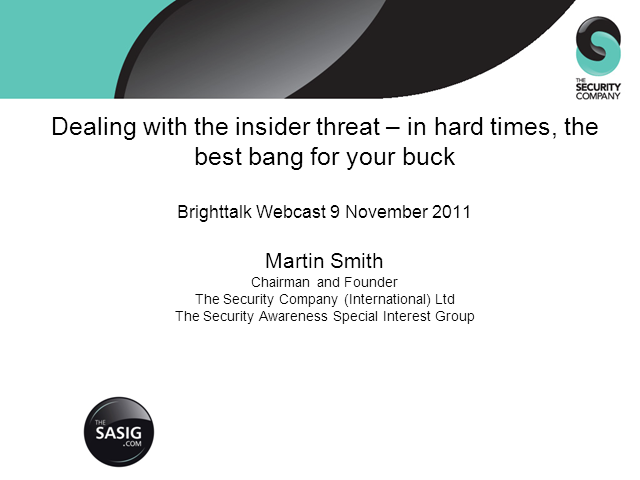 This presentation will describe ways to tackle the insider threat. For the smarter organisations this presents an opportunity in harder times to quickly and significantly reduce their exposure through straightforward and relatively inexpensive initiatives. - People want to be more secure – there is an enormous willingness amongst workforces to follow good practice. How can we harness and channel their support? - Dealing with breaches of trust rather than breaches of security. - Getting their attention – moving employees from being unaware to being committed to information protection, using real-life stories and subject matter that people are concerned about. - Measurement – “if you’re not measuring, you’re only practising”. - Case study and proposed model for an effective security communications programme.